Photo by Belinda Lawley, courtesy the Lethaby Gallery. Greeting me at the entrance of Lethaby Gallery are a number of white blouses—more so exoskeletons—pinned to a wall. Near the back of the gallery, drawn curtains and a carpet are both frozen into mirrors. Strewn about the space like forgotten toys are colorful string bracelets while imaginary garments cast their shadows on blank white walls. Everything seems so still but also perhaps just moments from coming to life. After navigating in and through her diverse body of work, this, I realize, is the trick (and ultimately the appeal) of Caroline Broadhead’s work: That everything is at once poised to move and arrested in time. On the same afternoon that I went to see Caroline Broadhead: A Retrospective at Lethaby Gallery, the artist herself was present discussing her work. 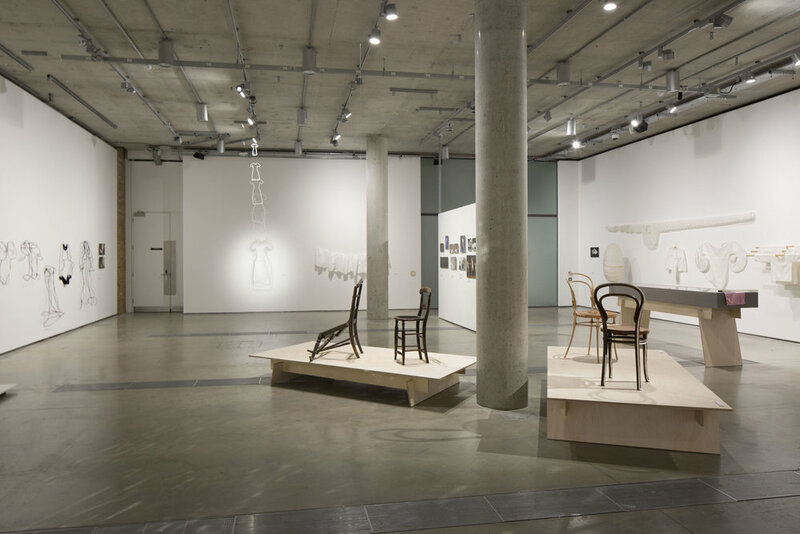 The retrospective of over 45 years of her contemporary art is said to be the first collection that Lethaby has ever let take over their entire space. For them, it’s a celebration of a career that began with, and now retires in, the influence of jewelry. An alumna of the school herself, Caroline held the position of Jewelry and Textiles Program Director and BA Jeweler Design Course Leader for nearly ten years at Central Saint Martins. It’s safe to say that Caroline’s work is steeped in the craft of jewelry making. However, in the presence of her multidisciplinary work—which spans textile arts, installation art, furniture, photography, and even performance—I noticed that jewelry ultimately only fills less than half of the room. Even so, the narrative that unwraps in the Lethaby Gallery’s retrospective is how the principles underlying jewelry, and specifically a sensitivity to the relationship between adornment and the body, seems to pervade her work. As Caroline meditatively discussed the way she approached her practice, she discussed the fact that where we mark the beginnings and ends of our own bodies concerns all art forms. She also reflected on how materials change when they encounter traces of life. Her concern with the relationship between our bodies and that with which we adorn them challenges most fixed definitions of jewelry, and for that matter all materials, whose assigned value is often degraded through the very process of wearing itself. Indeed, the word worn unfortunately comes with a suggestion of destruction — as if materials lose their integrity from exposure to people and time. A worn-out shirt has sweat in the armpits and pilling on its flesh. A worn-out chair has faded in the light of a sunny window. A worn-out word is strung together so many times that it becomes gibberish. Jewelry, however, evades most of these notions of wear and tear. Hard metals, set stones, and chiseled shapes do a pretty good job outlasting the impact of life, thereby negating the uncommon beauty of wearing altogether. A retrospective is often the first moment at which that a lifetime of work appears in same room. The retrospective is therefore a significant opportunity to distinguish earliest work from earliest motives. What became clear through the Lethaby Gallery retrospective is the fact that Caroline’s four decades of work wouldn’t have evolved the way it did without her early experience as a jewelry maker—a practice through which she had an immediate way to put the body in contact with movement, flexibility, and traces of being worn where you might not otherwise expect it. The exhibition is organized in such a way that one can easily wander through without necessarily considering chronology. For me, however, understanding the entirety of her oeuvre required understanding her earliest pieces. These earliest pieces, however, were perhaps too tucked away to the side of the gallery—especially given how foundational the thinking was to the entire show. Namely, these earliest objects evidence Broadhed’s interest in disturbing the idea of precious materials. There is something critically provocative about items like Fingerprint Bracelet (1973), which has edges imprinted as though the metal were clutched tightly, or Drip Necklace and Brooch (1973), which has a center seemingly warmed and melted by body heat. Although fit is rarely a consideration for most contemporary artists working between the worlds of art and fashion, Caroline admits that most of her pieces on display were measured to actually fit someone before she realized that wasn’t necessary. The matter of wearability was her impetus for finding ways beyond jewelry to close the distance between us and our dress. With the matter of wearability in mind, when Broadhead’s art started to resemble clothing, it took the form of a series of shell-white shirts. In her series Seven Ages (1986), Broadhead created each piece around a different gesture. Across the gallery from her gestural shirts was a shirt titled Wraparound (1983) shirt and a Siamese-style garment called Twinshirt (1989). Each garment, however, left the viewer wondering about how each might actually be worn. Indeed, to stand in front of each garment on display, is to imagine the feeling of pushing those exaggeratedly-long sleeves up your arms over and over again or unwinding yourself from the skins of one shirt webbed between seven sleeves. In any case, you’re left wondering if the material would look different if it were around you. Her point comes through strongly in the last garment of the Seven Ages series—the one she made to represent old age. The idea was that the shirt would be made to fit her, out of linen so it could embrace the wrinkles she wore it into it. After she did in fact wear into it for a while, she pinned down each crease that had laughed itself into the shape; however, it was the one piece in the series that was tacitly unwearable. The most halting part of the retrospective, however, is her work with shadows. Among the games she plays with light and dark, you realize each form of shading she created was yet another garment through which the viewer might be able to glimpse the edges of their own bodies. 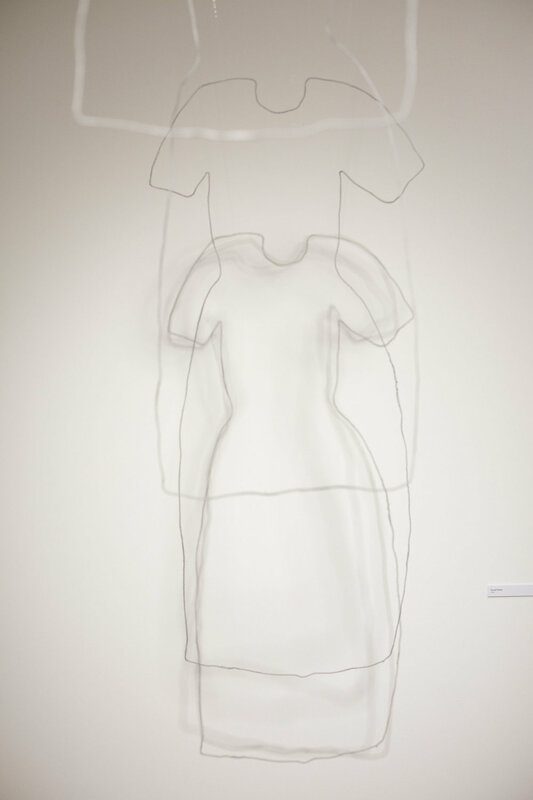 Shadow Dress (1997) separates the inner self from its outward appearance. Tunnel Dress (1999) frays its outer seams the more it pulls away from the wall. Light Interrupted (2017), painted in permanent sun and shade, completely tests the feeling of being invisible after you pass in front of it over and over again and the light doesn’t change. While I was there, I watched almost everyone who walked into the exhibit head right towards the mirrored curtain that dominated the center of the room. Standing in front of the shattered curtain, visitors could witness themselves pixelate in shards of a hand-cut damask reflection. Caroline draws visitors to the shadow magic of materials that wake up and change because we’re there: no matter how well pieces cover, hang off of, or stand up with time, it’s tempting to come closer because we know fundamentally materials are as rare as they are worn. We only sometimes forget that to wear is to let the textures we live in record the uniqueness of how we move, heat up, stretch, touch, face, and change. Celina Bussière is a fashion researcher and writer based in both London, UK and Toronto, Canada. Currently working in both public and private fashion archives, her interests are particularly in the urban, avant-garde, and sub-cultural insights implicit in fashion. Celina has a Masters in Fashion Communication: Critical Studies from Central Saint Martins where her research looked at the concept of 'anti-fashion' as a fundamental critique on appearance that exists in both fashion and modern architecture.